Description: Henry loves chocolate so much, it practically runs through his veins. Chocolate cake, chocolate cereal, chocolate syrup, chocolate milk, and chocolate cookies—and that’s just breakfast! Still, it comes as a shock when he suddenly breaks out in chocolaty brown spots and is diagnosed with . . . Chocolate Fever. And, rather than be poked and prodded by doctors, Henry runs away, starting the adventure of a lifetime. 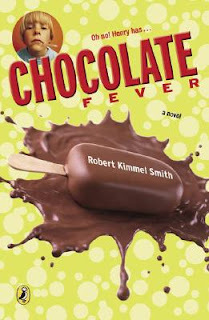 But at the end of it all, the question remains: Is there a cure for Chocolate Fever? I thought this would be a fun read for Valentine's Day--what is the day without chocolate? This is a fun book, a light lesson on the dangers of excess!